In January 1900, the Chicago Chronicle published a political cartoon called "The Forbidden Book." It showed President William McKinley refusing to give Uncle Sam the key to a padlocked book entitled "True History of the War in the Philippines." Shortly thereafter, a war that saw the deployment of 127,000 U.S. troops to the Philippines and the deaths of hundreds of thousands of Filipinos between 1899 to 1902 was relegated to the footnotes of history. The authors of a new book on the Philippine American War use some 200 political cartoons as a means to unlock the history of that war. Eighty-eight colored cartoons are taken from the pages of popular magazines like Puck and Judge. About 133 black-and-white political cartoons are reprinted from newspapers including the San Francisco Evening Post, New York World, Washington Post, Boston Globe, Philadelphia Inquirer, New Orleans Times-Democrat, Minnesota Journal, St. Louis Republic, Detroit News, Denver Evening Post, Los Angeles Times, etc. as well as journals such as Life, Harper's and Collier's Weekly. Twenty-seven historical photographs are added to compare with the cartoons' stereotypical depictions. The Introduction discusses America's economic transformation after the Civil War, Manifest Destiny, the conditions facing the "other" America (immigrant labor, native Americans, Blacks, and Chinese), the Philippine Revolution for independence from Spain, Cuba and the Spanish American War, the decision to annex the Philippines, the start of the Philippine American War, and opposition by the Anti-Imperialist League. The cartoons are divided into nine major themes and introduced by essays at the beginning of each chapter. The Epilogue describes how the Philippine American War came to be forgotten and the aftermath of the U.S. conquest of the Philippines. Readers will find striking similarities between a U.S. war fought more than a century ago and the events of today. About the authors: Abe Ignacio is an avid collector of Filipiniana materials from the Philippine American War and received his BA in ethnic studies from the University of California at Berkeley. Enrique de la Cruz is professor of Asian American studies at California State University at Northridge and received his doctorate in philosophy from the University of California, Los Angeles. Jorge Emmanuel is president of a research firm and received his Ph.D. in chemical engineering from the University of Michigan where he was also an associate of the Center for South and Southeast Asian Studies. Helen Toribio is Lecturer in Asian American Studies at City College of San Francisco and San Francisco State University, and received her MPA from California State University at Hayward and MFA from University of San Francisco. The brutal war waged by the United States against the Filipino people at the turn of the century has been shrouded in darkness for a long time, the truth concealed from generations of Americans. THE FORBIDDEN BOOK brings that shameful episode in our history out in the open, with a wonderful combination of crystal-clear text and extraordinary cartoons. The book deserves wide circulation. Brimming with insights into the beginnings of American imperial policy overseas, this book reconstructs an era that was to shape and refine U.S. intervention in the modern world. Through political cartoons in an era when the colonizer itself worked to hide the truth from the American people about the forgotten war a century ago, this book restores for the present generation a past marred by misinformation, racism, blind patriotism and outright lies. A thought-provoking education about the miseducation of the American people by arrogant imperial leaders whose successors never seem to learn the lessons of history. A particularly relevant book which makes it essential reading for the present generation of Filipinos and other colonial subjects of the modern PAX AMERICANA. 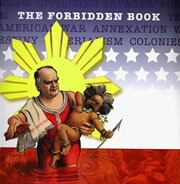 In this extraordinary collection of political cartoons from the period of the Philippine-American War and subsequent colonization, frank visual satire and caricature vibrate with 'forgotten' histories from the turn of the 19th century: they link U.S. imperial conquests in the Pacific to those in the Caribbean, refract American perceptions of Filipinos through its devastating treatments of blacks and native peoples, explicitly admit U.S. ambitions to employ not only war, but education and culture, to surpass the reach and power of the European empires by the end of the 20th century. These 'forbidden' images are windows onto an earlier moment in the history of American empire, a history in which we still live and struggle today. Lisa Lowe, Professor of Comparative Literature, University of California, San Diego; author of Immigrant Acts.